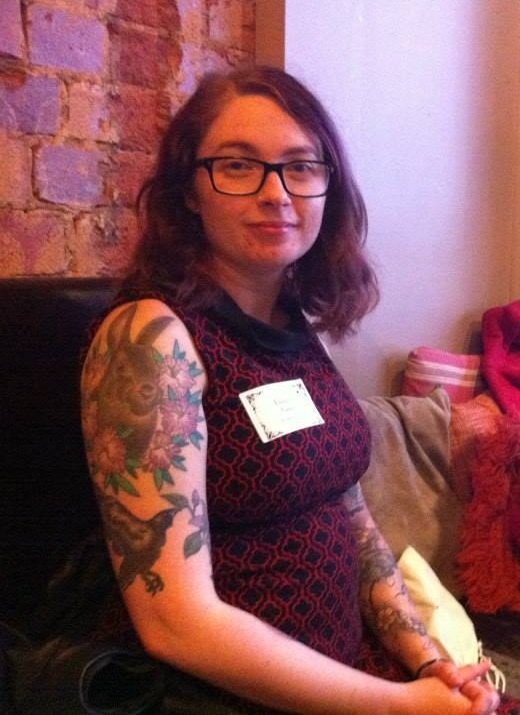 This post is part of our short series of interviews with people who volunteer in the GLAMR industry (Galleries, Libraries, Archives, Museums, Records). The series began with our participation in #blogjune, but there are too many splendid volunteers, places and stories to restrict them to just one month! These stories will highlight the wide range of volunteering opportunities across Canberra, and showcase our local volunteer heroes. You can also find out how to volunteer! 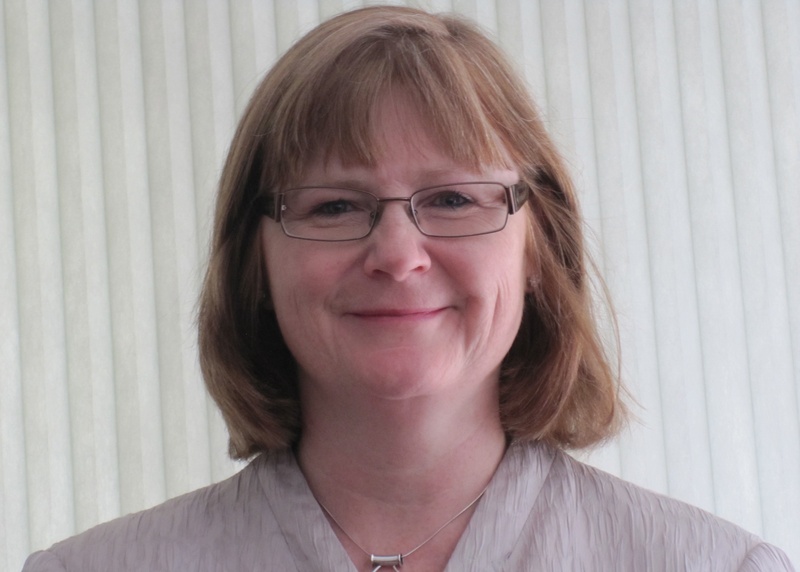 Our eleventh interviewee is Aileen Weir, who volunteers as a board member with ALIA (Australian Library and Information Association). I can’t think of a time in my career when I wasn’t involved with professional associations and I have never regretted it. Working on ALIA committees is a great way to network with people you wouldn’t normally encounter and the contacts you make can be invaluable for your own career progression. Helping to plan conferences, seminars or other events is a terrific way to develop your skills. Approaching potential sponsors and speakers, planning a budget or perhaps chairing a panel session on the day, all require skills you may not have the opportunity to exercise in your day job. Over the years, I have been on numerous committees and, in addition to what I gained professionally, have made many friends. What are the benefits of volunteering on the ALIA Board? It is a real privilege to be a member of the ALIA Board and I remain indebted to former President, Vanessa Little, for encouraging me to take on this role. I am now in my fourth year and have learned a great deal about the challenges facing our profession and the excellent work done by many people across the country to promote our skills and advocate on the issues that matter. As a Board member, I have an opportunity to contribute on a strategic level and help shape the Association’s priorities and advocacy agenda. I believe strongly in the values of ALIA – equity of access to information, preservation of the human record – and am proud of the many activities the Association undertakes to promote them. Volunteering in any capacity is worthwhile, whether through the Board, our many useful and important Advisory committees, or one of our Groups at the local level. What is the most enjoyable aspect of your volunteer role? How does your current role differ from your previous ALIA volunteer roles? It is hard to pin down what I find most enjoyable. I have always felt a strong responsibility to give back to the profession that has supported me throughout my career. I certainly have great respect, admiration and, in many cases, friendship for the colleagues I have worked with over the years. Colleagues you meet through association work can be great informal mentors as they are one step removed from your work environment, but familiar enough with what you do to offer advice. I know that volunteering has extended my own skills and helped position me for leadership roles in my career. As an employer, I always look twice at someone who is an active ALIA volunteer – to me it demonstrates initiative, commitment, leadership qualities, and professional pride. How do people express interest to volunteer with ALIA? There are many ways you can get involved. There are numerous groups and advisory committees you can join, all listed on the ALIA website, as is information about running for the Board. Talking to anyone you know who is already involved with ALIA is a great way to indicate your interest. Another way is to contact Diana Richards, the ACT/NSW State Manager. Diana would be happy to tell you which groups are active in the ACT or explain other ways that you can get involved. Many people encouraged me along the way so, if someone taps you on the shoulder and suggests you get involved, I strongly recommend you do it! Like most things in life, the more you put into it, the more you’ll get out of it! If you’re based in Canberra and would like to find out about events run by our local ALIA groups (including URLs ACT, but also ACTive ALIA, ALIA APSIG and ALIA OPALS ACT), please see the ALIA in the ACT webpage. Also, remember to sign up for the FAIR (Freedom of Access to Information and Resources) and ALIA Weekly newsletters. They are a great way to learn about ALIA activities and campaigns, such as the recent terrific (and delicious) Cooking for Copyright campaign. What’s the best thing to do on a rainy night? Attend our movie screening of course! We’ll be in the theatre at the National Library watching Wings of Desire  (with grateful thanks to Madman Entertainment for their in-kind support for making this screening happen). Our post below has a bit more background about fundraising for Elizabeth. We hope to see you there tonight, 5pm for the 5:15pm screening at the National Library’s theatre (LG1, access via the elevator or stairs). If you need to cloak your bags, there are lockers on the same level. Optional RSVP via facebook, or just attend on the night. Movie tickets are $10 each (at the door). Hamper raffles drawn at 7:25pm. 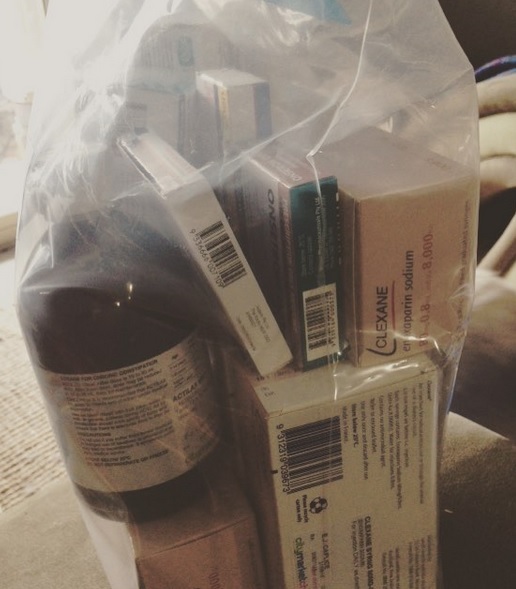 Elizabeth is preparing for more chemotherapy today – more than half of her carry-on luggage is medication (18 different medications and travel clearance letters). We wish her all the best for her exciting travels which start next week! We are really pleased to be able to help towards making this dream trip a reality. Would you like to donate, but can’t visit the Library to buy a raffle ticket or see the movie? Please consider donating to her youcaring account for “Beth’s Icelandic Adventure To Give Cancer The Middle Finger”. Posted on August 25, 2015 August 24, 2015 Categories EventTags boat, Canberra, chocolate, film, Iceland, movie, popcornLeave a comment on Movie night tonight! 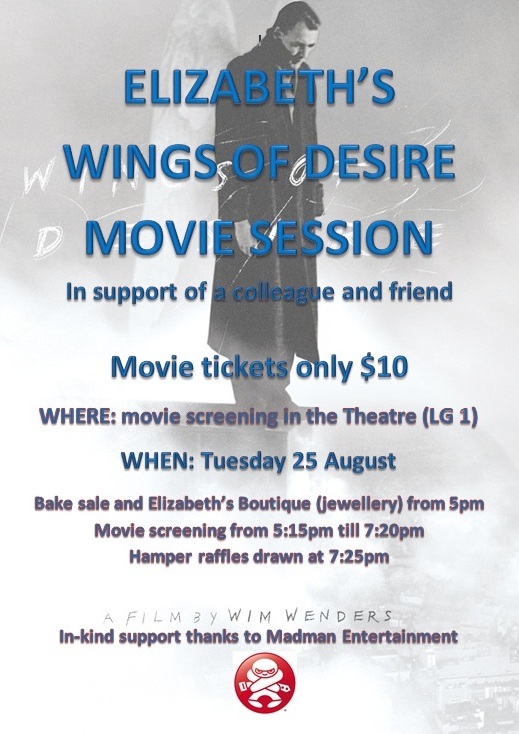 The Canberra Library Tribe is pleased to assist Elizabeth’s Fund in presenting a screening of ‘Wings of Desire’  (with generous support from Madman Entertainment). 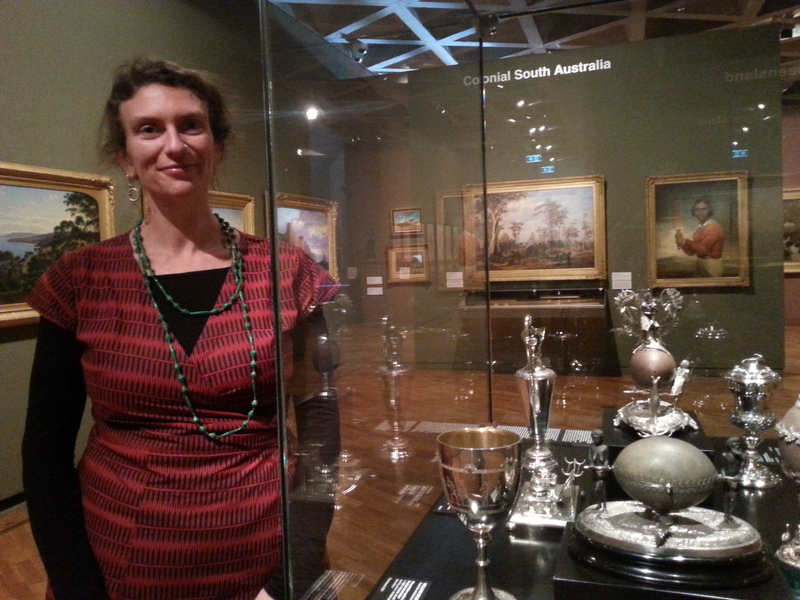 Elizabeth Caplice is our colleague and friend, and a keen supporter of the Canberra Library Tribe. At the age of 29, Elizabeth was diagnosed with stage IV metastatic cancer. 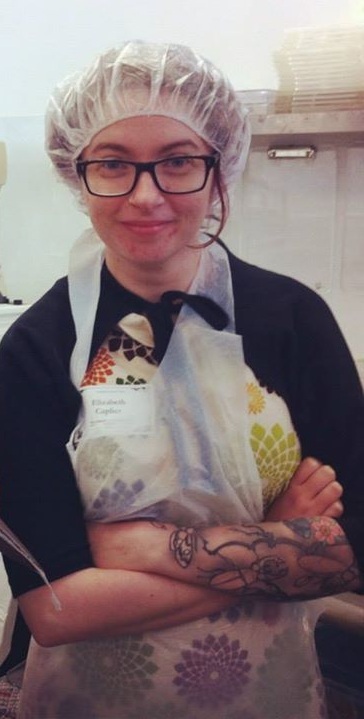 Elizabeth’s prognosis has recently worsened, and as a result, Elizabeth’s Fund has stepped up fundraising efforts to enable her to complete items on her ‘bucket list’. Elizabeth will shortly be travelling to Iceland. You can find out more about her ‘bucket list’ quest in a recent article from the Canberra Times. The movie screening will be this Tuesday 25 August, in the theatre of the National Library of Australia (LG1). We look forward to seeing you there at 5pm for the 5:15pm screening. RSVP via facebook, or just attend on the night. Movie tickets are $10 each, they can be purchased at the door on the night (we are also selling them in the Library’s foyer this Saturday afternoon). Snacks and raffle tickets will also be available to purchase. Raffle tickets are $3 each (or 4 for $10!). You don’t need to be attending the movie to buy a raffle ticket, we will contact the lucky winners. 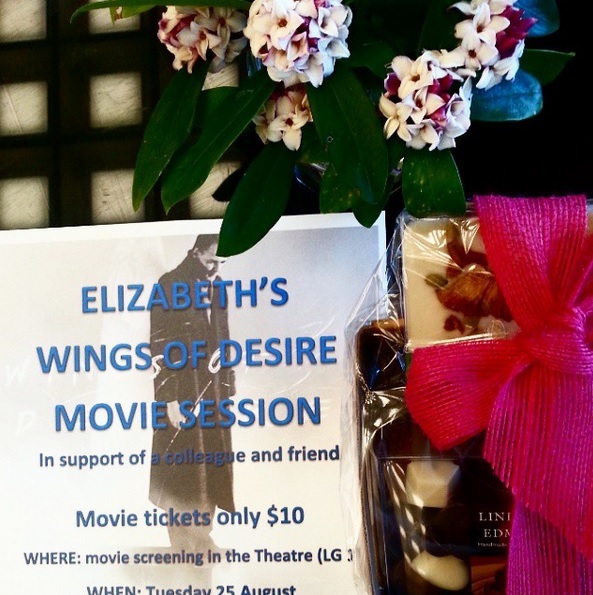 ‘Wings of Desire’ is Elizabeth’s favourite movie, and we really appreciate Madman Entertainment’s in-kind contribution in allowing us to screen it for this fundraiser. We will be doing a series of hamper raffles over the next few weeks. The one that will be drawn on Tuesday after the movie really is marvellous. It even includes a DVD of the movie we’ll be screening! One hour lake cruise for 2 adults & 2 children from Lake Burley Griffin Cruises, a Chocolate hamper from Lindsay & Edmunds, ‘Wings of Desire’ DVD from Madman Entertainment , U2 Stay (Faraway, So Close!) 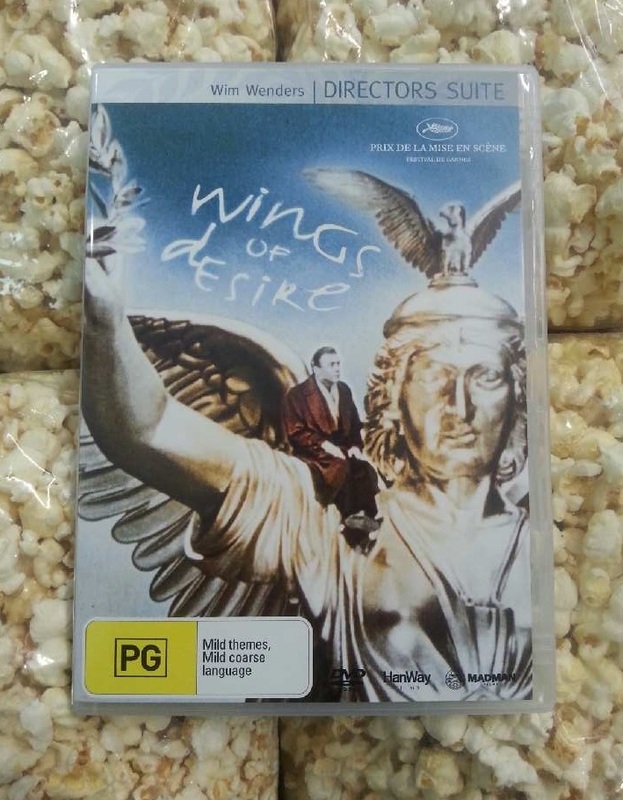 from sequel to Wings of Desire CD and Popcorn from Canberra Classic Corn. Lake Burley Griffin Cruises provides tranquil cruises on Lake Burley Griffin aboard whisper quiet boats and find out about Canberra’s best kept secrets from skipper Jim Paterson. Cruises resume on 7 September. Lindsay & Edmunds create award-winning handmade chocolates (certified organic and 100% Fairtrade). The Canberra Library Tribe enjoyed a chocolate-making course with their team in 2013 (see photo above). Madman Entertainment is Australia’s leading independent theatrical, home entertainment distribution and rights management company. Visit their site to buy DVDs, Blu-Ray and digital releases of your favourite anime, manga, films, and TV series. Canberra Classic Corn makes delicious popcorn right here in the capital. They sell at Old Bus Depot Markets and Hall Markets (as a side note – our hamper has 4 big bags of popcorn, and the tantalising scent has been driving us wild! You can re-microwave it to make it crispy and crunchy. We promise we haven’t eaten any of the hamper stock!). Background on Elizabeth’s Fund: Is a small group of National Library of Australia staff who have banded together to fundraise for Elizabeth. We have sold chocolate, held bake sales and sausage sizzles and repaired and sold donated jewellery. We will continue to fundraise to help with Elizabeth’s ongoing costs and to send her to Iceland in some style. Would you like to volunteer with us? Canberra Library Tribe is an informal friendly group for GLAMR people in Canberra and surrounds. We were established in 2013 and represent a broad range of information management sectors. We have had preconference meetups, career talks, a teddy bears’ picnic, bookshop scavenger hunts, performed a Rapunzel play, a mentorship program and a “finance for GLAMR people” session. We don’t require membership and most of our events are free or run on a cost-recovery basis. We have lots of future event ideas including craft meetups, green library activities, playground catch-ups and more. Canberra Library Tribe is currently looking for new Committee Members to join our team. These are volunteer positions, but you will develop fantastic skills in working as part of a team, organising events and project management. Plus we are super fun! We currently have 5 team members on the committee and would love to have 2 or 3 more people. We usually have 3 events per year so it is not a big time commitment but the role does involve social media scheduling on a rostered basis. You can find out more about us on twitter or facebook. This position description applies to each member of the Canberra Library Tribe committee. Assist in writing blog posts (ad hoc). Be enjoyable to work with and to be part of our team! Average time demand per month: 3 hours or less (email communication), more for event planning, more for social media (if on the roster for that month). Please send your expressions of interest to canberralibrary tribe [at] gmail [dot] com by COB 4 September 2015. If you have any questions, please email us at the same address. There’s no word limit for the EOI, just tell us why you’d like to be involved and include a resume (if possible). Image credit: Creator unidentified. 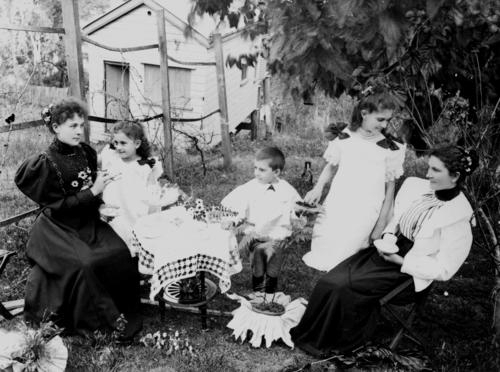 Taking tea in the garden, 1890s. John Oxley Library, State Library of Queensland, 1890-1900. Copyright expired.